AT 69, THE DIVINE MISS M HAS A NEW ALBUM OUT AND A HUGE TOUR IN THE OFFING. JUST DON’T CALL IT A COMEBACK, AS BRIAN FINNEGAN DISCOVERS. “Thank you,” she says crisply, as if an agenda item is being checked off, and I pull back, internally beating myself up for coming on all ‘number-one fan’. She has, I’m sure, heard variations on this so many times over the four and a half decades of her career, particularly from gay men, it probably all blends into white noise. That career, of course, began with gay men during the summer of 1970 in New York City, when she performed at weekends in the now legendary Continental Baths, with Barry Manilow as her pianist. The 24-hour venue was the hub of gay liberation in the city, with its disco, cabaret lounge, sauna rooms and ‘Olympia Blue’ swimming pool. “It was a very carefree time,” Bette remembers. “There was no such thing as Aids, there were no drug deaths really when I first started, none that you could count anyway. There was a war, but it felt like a very small war; it didn’t involve the entire world and it wasn’t a religious war, so the terrors were not as great. At the time New York was far from what we know nowadays. Times Square was a place you wouldn’t dare go near at night, crime levels in the city were through the roof, and it had a sleazy, dangerous reputation. It was also a perfect melting pot for outsiders and radicals, and it had a thriving creative underground. I ask whether she feels there’s space for such an underground movement nowadays. In 1972 Bette won a Grammy for her album The Divine Miss M, the title of which referred to one of the characters from her Continental Baths stage show. It was a toe in the mainstream, complete with a number one hit – her high-octane rendition of the Andrews Sisters’ ‘Boogie Woogie Bugle Boy’ – but it would take another 14 years before Bette Midler became a household name with the comedy film, Down and Out in Beverly Hills. In between there was an Oscar in 1979 for the loose Janis Joplin biopic The Rose, which Bette still cites as one of her favourite films from her career. The latter has a huge gay following, but Bette seems surprised when I mention this. I ask her why she thinks it might be, and she replies, “Beats me”. Then she brings up her 1993 Disney Halloween comedy Hocus Pocus. Indeed Hocus Pocus recently made headlines because Bette mooted the idea of a sequel in a Q&A on Reddit, telling fans to write and persuade Disney to do it. “We were just having fun.” she says, when I ask if she’d really do a sequel, dashing the hopes of Hocus Pocus fans everywhere. Bette’s here to talk about latest album, It’s The Girls!, a collection of girl group covers, with a heavy emphasis on ’60s bands like The Ronettes, Martha and the Vandellas, The Shirelles and The Supremes. It’s standout track is an odd choice, a slowed-down version of TLC’s 1996 blockbuster, ‘Waterfalls’. This leads me to ask a question about the post-Aids gay community, and in particular the introduction of the pre-HIV exposure drug, Truvada and its game-changing affect. “You’re talking about that drug?” she says. “Somebody was talking to me about it being a recreational drug, but I don’t know anything about it, so I can’t really comment. If you haven’t been completely ruined by your parents or your childhood, most human beings are programmed to go forward. Part of Bette’s enduring place in the communal gay heart is this sense of survival. Her career has had more phases (and awards) than Madonna’s, she’s about to embark on a massive tour, and last year she appeared in her first ever Broadway play, the one-woman show, I’ll Eat You Last: A Chat With Sue Mengers to huge critical acclaim. I ask her what she thinks drives her forward. Much has been made in the media of It’s The Girls! as yet another comeback for Bette, but she dismisses the idea. But at 69, in an industry that prizes youth, especially in women, it must be harder and harder to pick up where you left off. It is only as my 15-minute slot with Bette inches to a close, that I finally get a glimpse of the gregarious, funny woman I had been expecting to meet. I mention to her that it’s the 300th issue of GCN, and that she will be gracing the cover. 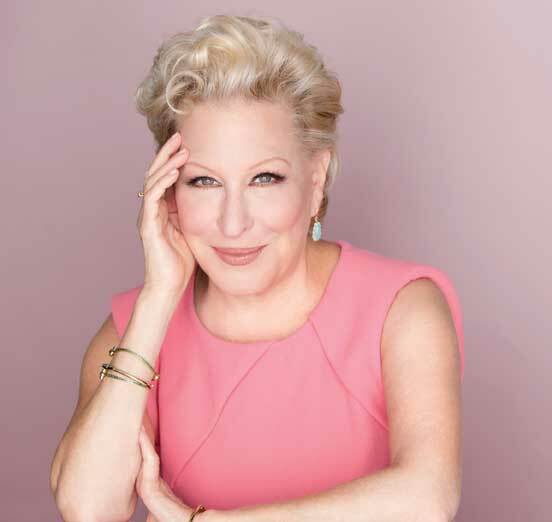 Bette Midler’s ‘It’s The Girls!’ is out now in good shops and online. To buy the magazine with this original interview, click here.